This extension offers a number of implementations for built-in functions (suffixed with "_ns") that allow GameMaker games to work with files outside of the "sandbox" directory. The extension allows application to work with files anywhere where it could by usual rules (which is basically anything not in disc' root or other UAC-protected locations). Paths with non-English characters are supported too. The extension also has full support for foreign characters in paths and files, and offers tools to convert between codepages if needed. For a list of functions, check out the online documentation. 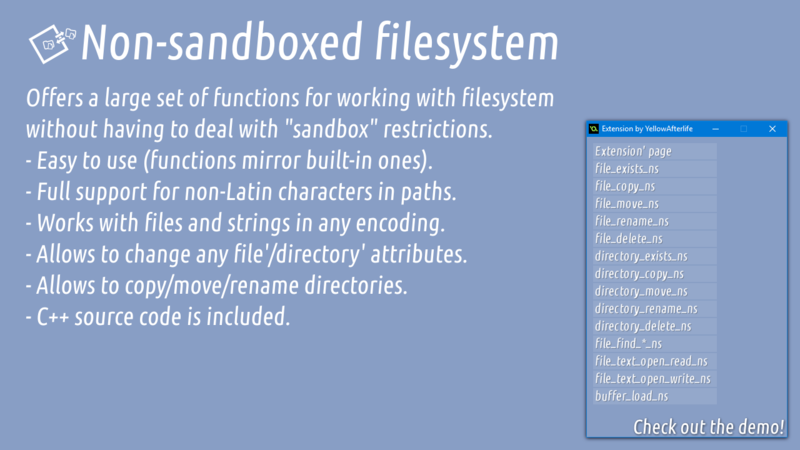 While some functions are yet to be implemented, this can be bypassed by copying the given file/directory into the sandboxed directory and working with it via standard functions there. Currently Windows-only. Given demand, Mac and Linux will be supported in future. 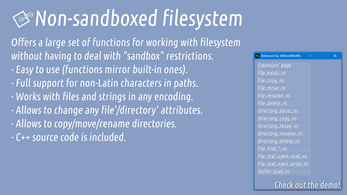 For a smaller-scale free alternative, check out my Windows-specific functions extension. 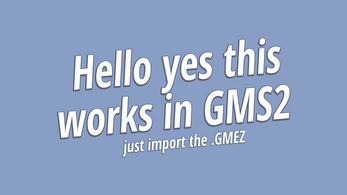 The extension can also be bought via GameMaker: Marketplace.